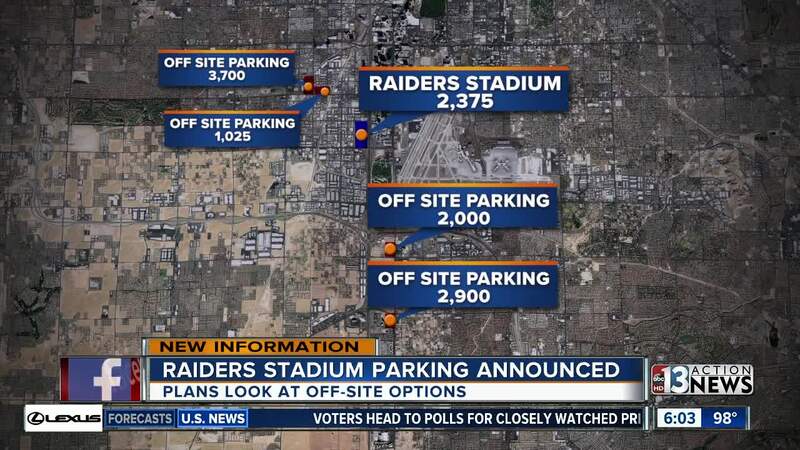 The plans have been released for parking options for the new Raiders stadium in Las Vegas. According to documents posted on Clark County's website , The Orleans hotel-casino, located near Tropicana Avenue and Arville Street, has entered an agreement to provide parking on the northern half of their property -- between 3,700 and 4,625 spaces. There would be a shuttle service to the stadium, located near Polaris Avenue and Russell Road, estimated to take between 6 to 8 minutes. An additional 1,025 to 1,175 parking spaces would come from a lot, also near Arville and Tropicana, the former Southwest Gas facility. It is expected to be on the same shuttle route as the first parking location. A parking lot near Las Vegas Boulevard and Arby Avenue would provide 2,000 to 2,500 parking spaces and would also use a shuttle bus to get to the stadium. While the first three parking areas are fairly close to the stadium site, the fourth parking area will be located near Las Vegas Boulevard and Blue Diamond Road. The property is expected to provide between 2,900 to 3,625 parking spaces. A shuttle is anticipated to take about 10 to 13 minutes to get to the stadium. In addition to four off-site parking locations, there is expected to be between 2,375 and 2,725 on-site parking spaces. The capacity of the stadium is estimated to be around 65,000. In a comparison provided by LV Stadium Events Company, Las Vegas' stadium would provide more on-site parking spaces than Minneapolis at 273, Cleveland at 1,164 and Baltimore at 1,890 and comparable to Cincinnati, Atlanta and Seattle. According to a letter from the LV Stadium Events Company, Chief Operating Office Don C. Webb states that the Raiders stadium is the first be completely designed in the age of rideshare and that they anticipate Uber and Lyft to reduce stadium parking needs over time. The parking plans were discussed at the Clark County Zoning Commission meeting Sept. 5. The commissioners accepted the report. The Raiders will continue to refine the plans as necessary. The Raiders stadium is expected to be complete by the 2020 NFL season.